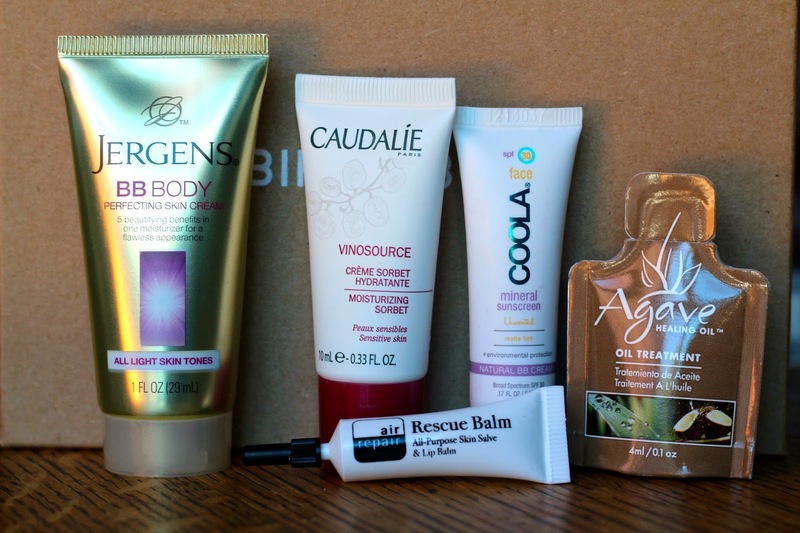 I have three Birchbox subscriptions, and this is the review for my first box, which is on my main account. 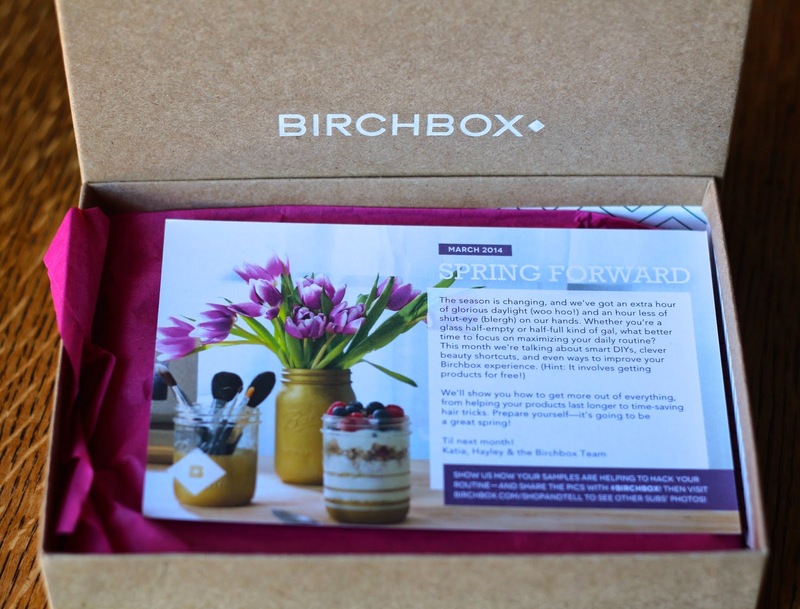 This Birchbox arrived in 4 days, from New Jersey to California, and is shipped via USPS. Jergens BB Body Perfecting Skin Cream - ($2) This is a Birchbox Find this month, and I already know I'm getting another one of these in my other box, so I handed this off to my mom. It's a tinted BB cream for your body, kind of like self-tanner? but less pigmented. We'll see if I use this, I like to go au naturale with my lovely shade of ghost white. Caudalie Vinosource Moisturizing Sorbet - ($10) Holy $#! @ this stuff is amazing! It's pretty expensive for the full size, and I have so many face moisturizer samples, but I think this may be the one I've been looking for. My face is not only not dry, but smooth, my pores look smaller, it's not oily, it doesn't have a strong scent (like my Vichy does), and it just goes on like cream (or sorbet, which is what they call it). I am crossing my fingers my third sub that I signed up for has another of these in it! COOLA Tinted Matte SPF 30 for Face - ($3.50) I got this last month too, and while it's nice, I'm not in love with it. I'm going to swap this because I still have a little left from my other sample. Agave Healing Oil Treatment - ($1) This smells like a lovely coconut cocktail I want to be sipping right now on the beach. Seriously, this stuff is wonderful for my hair. I am so down with any product that can make my hair soft, smell pretty, and make it look like my ends aren't full of split ends (I hate haircuts, leave me alone!) This stuff did all three and I'm considering purchasing it with my next points purchase. Air Repair Rescue Balm All-Purpose Skin Salve and Lip Balm - ($1.50? there's no amount listed on the sample so I estimated) I have to say I don't care for the medicine-y smell this has, but after a few minutes it goes away and leaves your lips moisturized for hours. I can't say I'd buy the full size, because I have so many lip balms that I like better, but I'll definitely be using up the sample. My box this month had a value of about $18, and you can't forget the $5 I'll get back in points for reviewing my products. I have to say I looked at my box page once this shipped and was so upset I didn't get any of the things I was hoping for this month. So much so that I signed up for a third sub.Now I have 3 products on right now and I am crossing my fingers I get more Caudalie in my third box! Maybe I'm not cut out for spoilers, but I love the items in my box after trying them. Birchbox is only $10 a month and they send you 5-6 (usually sample size) products. If you really like the sample, they offer the full size version on their shop for you to purchase. If you sign up between now and 3/16, use the code BB100 to get 100 points with your subscription, equal to $10 off in the Birchbox shop! Thanks! I love the Beauty Protector that you got though, and I have the eyeliner coming in one of my other boxes, can't wait!